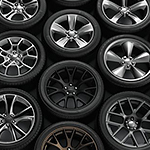 Have you noticed your car’s tires are turning a different color? If you want to make sure that this doesn’t happen, you should clean your tires every week. This ensures that your tires won’t crack or weather because of all the dust and debris. Another tip is that you should always use a professional grade tire cleaner that you can dilute in a bucket. You’ll need a foam applicator brush or tire brush in order to get a deeper clean on your car’s wheels as well. One more tip is that you should always wash your car’s tires first. This is because the garden hose or pressure washer can splash up grim from the axles onto your vehicle. To save time, you should just wash your tires first and then you can rinse it all off from hood to ground. Want to get a superior clean? Stop by the service department at National Auto Plaza for affordable automotive services.